Open until 9 p.m. this fall! 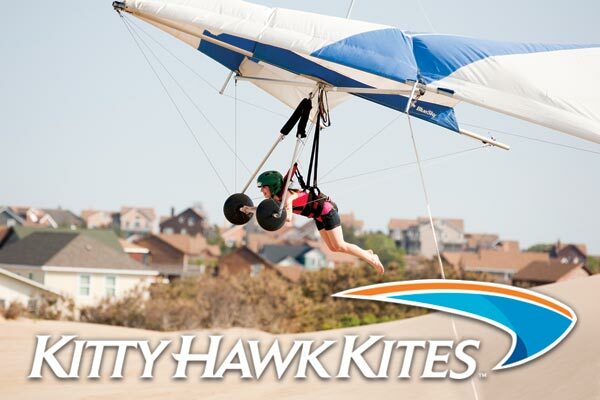 Kitty Hawk Kites is the leader in recreation in the Outer Banks. Nags Head is home to our Dune Hang Gliding Lessons—where we have taught more people to fly (over 300,000 and counting) than any other Hang Gliding School in the world. Kayak tours are available in many towns on the Outer Banks, some of which take place in Nags Head and Kitty Hawk. New in 2010 is Waves Village Kiteboarding Resort—one of only two of it’s kind in the US. Other Recreation includes (but is not limited to): Tandem Hang Gliding, Ultralight Hang Gliding Instruction, guided Kayak Eco-Tours, Parasailing, Rock Wall Climbing, Dolphin Tours, Sail Boat Cruises, Aero Tours, Surfing, Segway Tours, Wakeboarding and Water Skiing. The Nags Head Kitty Hawk Kites store is our flagship store. We have the most unique (and family friendly) t-shirts available on the Outer Banks, as well as coastal gifts, jewelry, the hottest toys out there, wind art such as garden flags, spinners, and windsocks, and of course, KITES! Anyone and everyone can (and does) find something they want at this store. Hang Gliding the Outer Banks on the dunes of Jockey’s Ridge State Park is the original Kitty Hawk Kites experience. Since 1974, we’ve been teaching people to fly. We routinely instruct people of varying ages (4-92) and fitness levels. Aspiring hang glider pilots come here from all over the world to learn to instruct, fly, and perfect their skills. Outer Banks Kiteboarding has proved to be a rapidly growing sport. Contrary to popular belief, this (like snow skiing) can be a very relaxing and serene experience. It can be whatever you want it to be! Check out our brand new kiteboarding resort in Rodanthe: Waves Village. Go to wavesvillage.com for a virtual tour. If you really want to touch the sky and get a one-of-a-kind view of the Outer Banks, try Tandem Hang Gliding. This is a 2000 foot (or mile high) flight with an instructor. It is, without a doubt, the most exciting (thrilling, adrenaline pumping, etc) one time experience we offer. Ultralight instruction is done by request only, so don’t hesitate to ask. For a more peaceful but no less picturesque adventure, experience one of our guided Kayak Eco-Tours which explore the unique ecosystems and natural history of the Outer Banks. Everyone can find a tour they like: casual paddling, inland tours, sound tours, sunrise/sunset tours, night tours, heavy paddling tours, and more! Wall climbing is a popular activity at our Nags Head, Corolla, and Hatteras stores. We also have a rock wall (and 16’ x 9’ inflatable movie screen) available for rent for your next event! Do you want to see dolphins up close in their natural environment? Try the Nags Head Dolphin Watch! It’s only $1 for infants, and very reasonable for everyone else. If the beach is where you want to be, make sure you get a surf lesson from our friendly instructors while you’re there. These guys have taught thousands of people how to surf—don’t be left out!